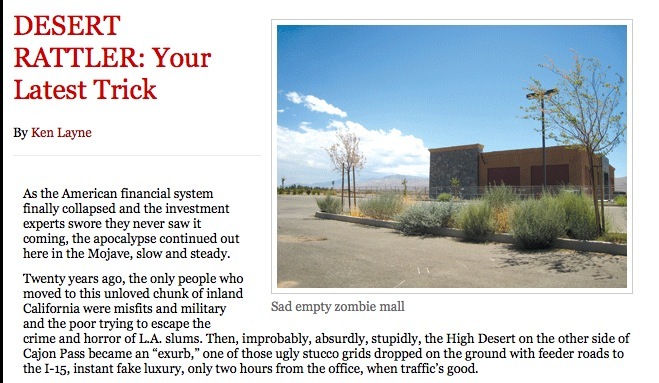 Ken Layne, the editor of Wonkette — a satirical political blog refreshing for its vicious and usually hilarious contempt for politics — mentioned in a New York Magazine interview last week that he lives on an “abandoned horse ranch” out in the Mojave somewhere. And he writes a column about it for the LA Citybeat alt-weekly. It’s done in the Ed Abbey tradition, as Layne fantasizes about shooting ATV enthusiasts, looks at the housing crisis from the perspective of ex-urban meth-mouths and watches desert cottontails frolic in the sunset. Good stuff: DESERT RATTLER.